The University of Toronto’s Truth and Reconciliation Steering Committee has released its final report, calling on the University to take action in six key areas. Entitled Wecheehetowin, which means “working together” in Cree, the report highlights that the work to be done at U of T will be a collective journey. Five working groups informed and shaped the steering committee’s final report and each group identified similar themes in its findings, Hamilton-Diabo said. The committee was established by University of Toronto President Meric Gertler and Vice-President and Provost Cheryl Regehr in early 2016 in response to the federal Truth and Reconciliation Commission’s challenge to Canadians to engage in an ongoing process of reconciliation. 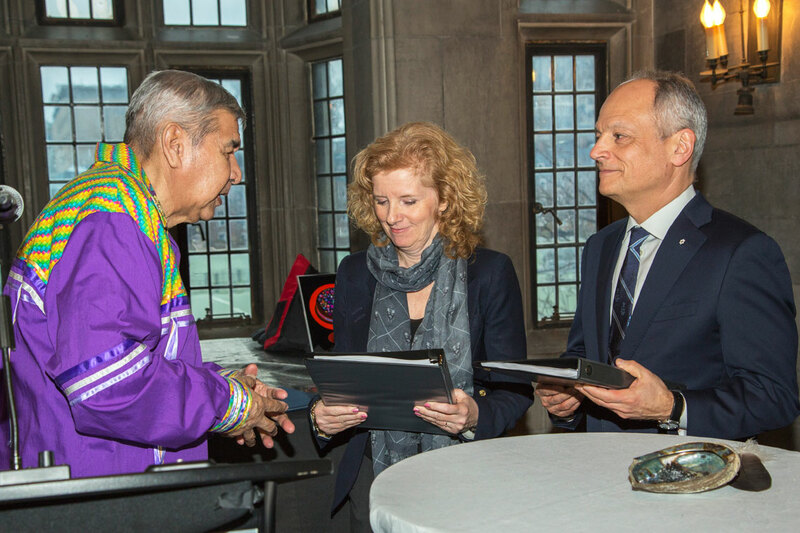 During a ceremony at Hart House Jan. 13, the final report was presented to the president and provost by Elder Andrew Wesley, one of two elders who advised the committee in its deliberations. “The University of Toronto acknowledges its responsibility in contributing to the plight of Indigenous peoples, and we embrace the opportunity to engage with Indigenous communities and, together, lead the process of reconciliation,” said President Gertler, who noted that this work is particularly important as the University and the country mark the 150th anniversary of Canada’s Confederation. The director of U of T’s Munk School of Global Affairs, Toope also served as co-chair of the committee. Hamilton-Diabo, who is also director of Aboriginal student services at First Nations House, said that this will continue to be an evolving process. Keeping the momentum going is important, Hamilton-Diabo said.